On Sundays, São Paulo’s Paulista Avenue closes down so that people can bike, walk and play sports. New data shows that the initiative has reduced air and noise pollution. Photo by Fernanda Latorre/Flickr. Major changes in thinking never happen easily. Projects that change established structures and routines typically encounter significant resistance along the way. Changing entrenched thinking, therefore, often requires finding ways to demonstrate the positive impacts of change. Paulista Aberta is one of those cases. 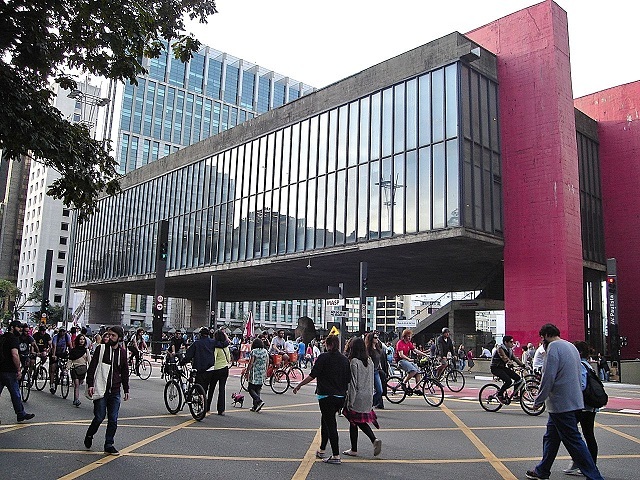 Paulista Aberta is an initiative that restricts traffic on the popular and crowded Paulista Avenue in São Paulo, Brazil every Sunday, turning the street over to people for cycling, walking and informal sports. Since 2014, local grassroots organizations Minha Sampa and Sampapé having be pushing for a car free initiative, but it wasn’t until June 28, 2015 the street was shut down for the first car free event. This pilot prompted a lot of discussion about the positive and negative effects that the carfree event might create. The local newspaper Carta Capital initially wrote that businesses and hospitals in the vicinity were opposed to the initiative. However, as the initiative continued on, numerous studies have helped to demystify some of the confusion. Survey data collected by Sampapé and Minha Sampa revealed that the hospitals as well as 50 percent of local businesses were actually in favor of opening the road to pedestrians and cyclists on Sundays and only 25 percent were opposed. Despite Paulista Aberta’s growing popularity and participation, the movement lacked evidence of the real impact that the initiative was having on noise and air pollution. Recognizing this gap, the University of São Paulo and a local NGO formed a partnership to measure results. The partnership conducted a study between November and December 2015 based on the methodology of the University of São Paulo’s Experimental Air Pollution Laboratory. Using field equipment that captures noise and particulate matter, the research team collected data from both a normal work day and a carfree Sunday. Contrary to critics’ claims, the team found that the initiative did not increase noise or air pollution. Even with deviations in bus routes—also a concern of critics—air pollution and noise levels in the surrounding areas remained lower during the carfree Sundays. 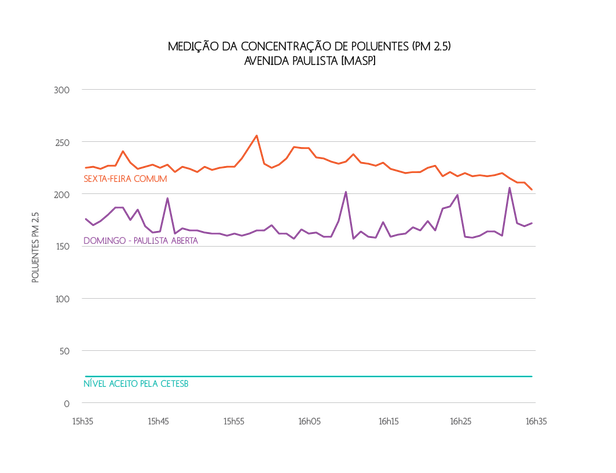 Air pollution is lower on carfree Sundays (lower line) than on the average work day (top line). 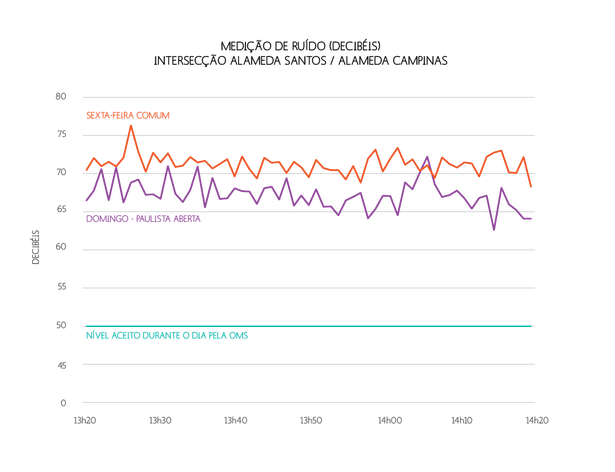 In fact, air quality improved at every collection point on carfree Sundays, compared to weekdays. Despite this, pollution levels still remained above those recommended by the World Health Organization (WHO). Noise pollution is lower on carfree Sundays (lower line) than on the average work day (top line). Similarly, noise pollution was found to be lower on Sundays, despite the number of people who participate in the public event. By giving decision makers tangible evidence of the positive impact of Paulista Aberta, the partnership has discredited critics and given weight to the carfree movement. This experiences suggests that local grassroots campaigns will be much more effective when they can demonstrate the real benefits of the carfree movement. This blog post was originally published on TheCityFix Brasil in Portuguese here.